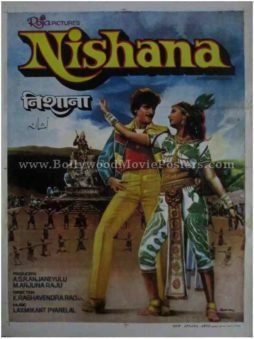 Vintage Bollywood poster for sale of the old Hindi film Nishana (1980). This is an actual surviving vintage Indian film poster for sale of the 1980 Bollywood movie that starred Jeetendra and Poonam Dhillon in lead roles. 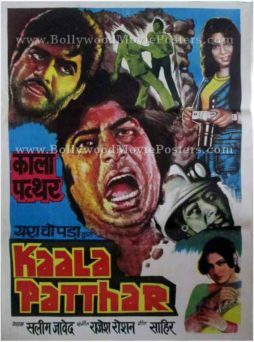 Printed and circulated during the initial release run of the film (somewhere in the early 1980s), this vintage Hindi film poster was designed for publicity of the movie but never ended up being used. This vintage Bollywood poster was originally designed in hand painted oil on canvas format. A stunning over painted portrait of the lead couple Jeetendra and Poonam Dhillon is seen prominently in the poster. The two appear in a dancing pose taken from a song from the film. Backup dancers are seen in the background of this vintage Bollywood poster for sale. Title of this vintage Bollywood poster is seen in a stunning yellow font set against a blue sky background on the top. Classic bollywood movie poster of the hit Hindi film John Jani Janardhan (1984) for sale. This is an actual surviving classic Bollywood film poster of the 1984 Hindi movie that featured the “highest paid actor in Asia,” superstar Rajinikanth in a triple role. 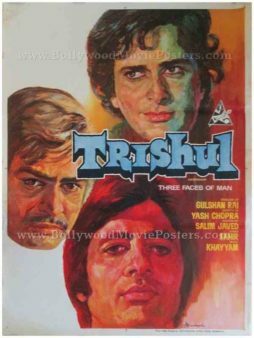 John Jani Janardhan was one of the only triple role Bollywood films to become a hit at the box office, making this Rajinikanth poster for sale, highly collectible! Printed and circulated a few years after the first release of the film (somewhere in the late 1980s), this Rajinikanth poster was originally designed for publicity of the film but never ended up being used. True to the triple role theme of the film, Rajinikanth is seen in all three avatars, i.e. as John, Jani and Janardhan in this classic Rajinikanth poster. 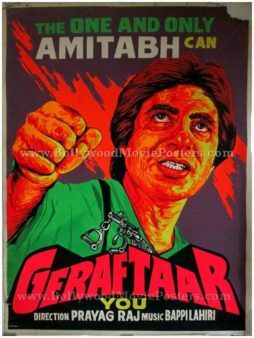 Very rare fluorescent Bollywood poster of the super hit Hindi film Geraftaar (1985) for sale. This is an actual surviving kitsch Bollywood poster of the 1985 film that featured the biggest superstar of Indian cinema, Amitabh Bachchan in the lead role. Printed and circulated a few years after the release of the film (late 1980s), this vintage movie poster was originally designed for publicity of the film but never ended up being used. Don’t miss this rare original Bollywood poster that has been over printed with a bright fluorescent shade, giving it an extremely kitschy appearance! Very few posters available in stock. This kitschy vintage Bollywood poster has been overprinted in a bright fluorescent shade, making it a one of a kind collectible! This poster has been graded as ★ As Is due to a missing piece on the top right (as seen clearly in the image). 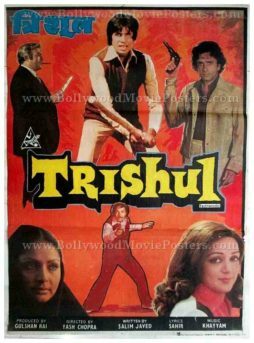 Old Bollywood poster of the super hit Hindi film, Trishul (1978) for sale. This is an actual surviving vintage movie poster of the 1978 film that starred the greatest superstar of Indian cinema, Amitabh Bachchan. Printed and circulated a few years after the first release of the film (somewhere in the 1980s), this old Amitabh movie poster was originally designed for publicity of the subsequent re-release of the film but never ended up being used. Vintage Bollywood movie poster of the Hindi film Yeh To Kamaal Ho Gaya (1982) for sale. 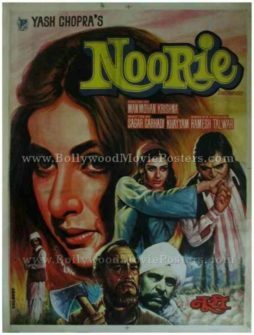 Printed and circulated during the first release of the film (somewhere in the early 1980s), this old Bollywood movie poster was originally designed for publicity of the film but never ended up being used. This is an actual surviving publicity poster of the old Bollywood movie Yeh To Kamaal Ho Gaya, which starred Kamal Haasan in a double role opposite actress Poonam Dhillon. Kamal Haasan is seen in two different avatars in this poster, in line with his double role in the film. This poster is one of the rare few photographic Bollywood movie posters designed by the highest paid Bollywood poster painter/artist Diwakar Karkare. With movie poster design shifting completely from hand painted art towards photographic cut paste techniques, Diwakar designed only a handful of photographic movie posters before shutting down his iconic art studio, Studio Diwakar in Mumbai in the early 1980s. 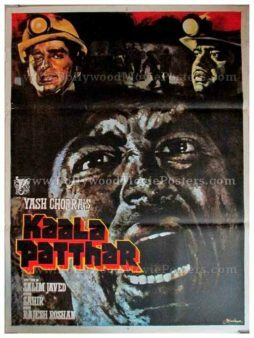 This photographic Bollywood movie poster was one of the last few photo cut paste designs made by master poster painter Diwakar Karkare. The poster bears his original signature in white on the center right corner. Yeh To Kamaal Ho Gaya (1982) is a popular Bollywood movie directed by T. Rama Rao. The Hindi film stars Kamal Haasan in a double role and is a remake of his Tamil movie, Sattam En Kaiyil. Old hand painted Bollywood pressbook of the Hindi film Yaadgaar (1984) for sale. This is an actual surviving press book of the 1984 Hindi film that featured Kamal Haasan, Poonam Dhillon & Sanjeev Kumar in lead roles. Printed and circulated during the first release of the film, this old hand painted Bollywood pressbook was originally designed for publicity of the film but never ended up being used. Old Hindi film press books are sometimes also referred to as song booklets, story booklets or synopsis booklets. They contain the lyrics of songs from the film in Hindi as well as in Urdu, and were designed to give theater audiences the chance to sing along while watching their favorite songs on screen. Old Hindi film synopsis booklets provide a further additional step of information – summarizing the plot of the movie as well as the star cast. This old Hindi film press booklet was designed using hand painted techniques on canvas, making it highly collectible! It features brilliantly hand painted artwork both on the front as well as the back of the booklet. 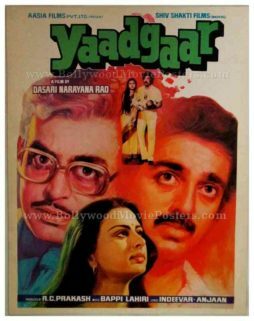 Yaadgar (Memorable) is a 1984 Hindi film starring Kamal Haasan, Poonam Dhillon & Sanjeev Kumar. Music for the film was composed by Bappi Lahiri. 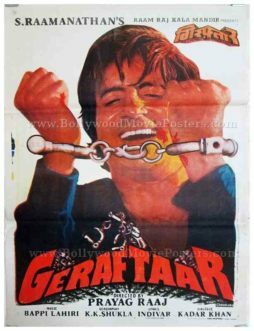 Classic old Bollywood poster of the super hit Hindi film Geraftaar (1985) for sale. This is an actual surviving vintage poster of the 1985 film that featured the biggest superstar of Indian cinema, Amitabh Bachchan in the lead role. Printed and circulated somewhere during the release of the film, this vintage movie poster was originally designed for publicity of the film but never ended up being used. This poster was originally designed by painting over a still photograph, making it very collectable. The poster features a large cut out photograph of Amitabh Bachchan in handcuffs. 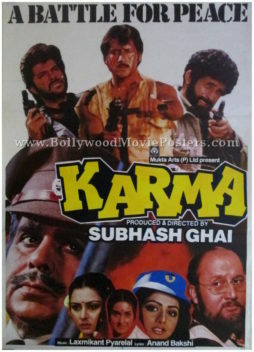 Amitabh appears laughing in the poster and a pistol with handcuffs hanging over its barrel is seen as a logo on the bottom. The typography used in this poster is entirely in English, except for a translation of the title in Devanagari Hindi on the top.